This topic contains 11 replies, has 5 voices, and was last updated by airscapes 02/01/2019 at 6:15 am. I’ll start with my motivation: I sharpen knives on the side and have been toying with ways to improve sharpening times, efficiency, finish, and edge sharpness. Currently, I start with the finest stone I feel I can use to reset the apex in a reasonable amount of time and continue through the 1000 grit diamond stone. From there, I use both sets of ceramics. Using both sets of ceramics is something I am still up in the air about. What I am most interested in is thoughts on whether to use the 4/2 emulsion on leather or the 1/0.5 emulsion on leather after the 1.4/0.6 Micron Ceramics. I am leaning towards the 4/2 but that is just from personal experience. I think either would be a valid choice. The 1/0.5 is going to be a closer match to the grit of the final 0.6 micron ceramic, but the grit progression from stones to strops is not a direct correlation. I would choose the 4 / 2 micron set, but I can’t say that I have a solid argument to support that choice. This is one of those things where there isn’t a definitive answer available (to my knowledge) and you will have to use your judgement. I get the impression that you have both sets currently. If so, you can always try it either way and see what works well for you. I experimented with sharpening on my JET double-ended buffing stand. I found I could sharpen most knives in well under a minute. I mounted a 600-grit cotton wheel on one end and a cotton wheel with white polishing compound on the other. I would make two passes on each side with each wheel. That’s four passes on the 600-grit, then four passes on the polishing wheel. Almost every knife would easily slice through phone-book paper. The ones that didn’t had more serious damage on their edges or were really, really dull to start with. Unlike stropping on the WE, polishing doesn’t seem to have the sensitivity to angle. At least not in my limited experience. It’s pretty easy to see if you’re getting too close to dulling the edge, so maybe that’s why. If you have access to a powered buffer, I’d suggest sharpening through 1000-grit on the WE, then give it a very brief buffing on the wheel. The polishing really is a form of stropping. If you’re spending ten minutes on stropping, that’s about nine-and-a-half you could save. I haven’t yet tried it for sharpening, but I have a compound called “pink scratchless” and it seems to do what it says. I have some disposable scalpel blades, which look to be ground on both sides with about a 600-grit belt or wheel, then polished on one side only. I assume that the one-sided polishing is intended to produce a very sharp edge, but retain some of the toothiness for cutting slippery tissue. The highest grit stone I have is 1000 and no stromps. I do have a new soft buffing wheel that can be installed on my drill press (what I bought it for). I also have white and red rouge .. Can you comment on wheel speed which if either rouge, or if I am just probably going to make a mess with a horizontal whee out in mid air.. .. Well thinking about it, might be a bit too dangerous.. Still would like the info on wheel speed and the rouge.. might bring the bench grinder in from the cold and put the buffing wheel on it. Stropping like other mediums has a progression from coarse to fine grit. The difference with stropping compounds are the abrasive grit materials are suspended in the stropping compound, whichever your using, (i.e., paste, emulsions or spray solutions), and they’re not affixed and held in place to the substrate, like sharpening mediums. This allows the grit to roll and move over and across the steel versus scratching it. 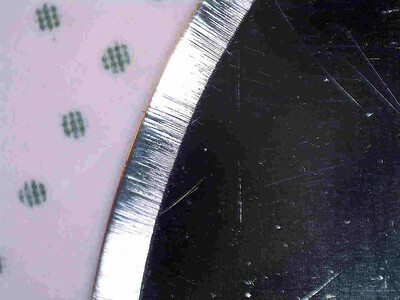 This gives the burnishing or polishing effect seen with stropping. I always follow everyone of my sharpening efforts with a final stropping. It takes the rough sharp edge and finishes it to a smooth sharp edge. This is best exemplified by trying to slice paper with the un-stropped sharpened edge. It grabs the paper and may even tear it. 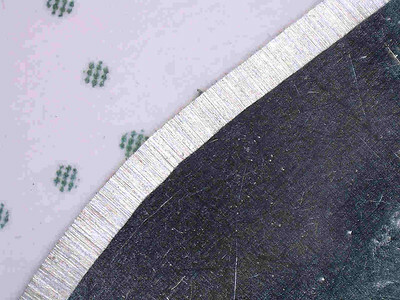 When stropped, this same sharpened edge will easily glide through the paper as it slices it to ribbons. Stropping seems to enhance and smooth the sharp edge allowing it to cut better without removing the character of the edge. It will leave a toothy edge toothy, but removes the coarseness and roughness of the edge. Stropping is really independent of what grit sharpening medium, or type of sharpening medium that precedes it. In other words if you sharpen to a finer grit, say 1500 grit VS 1000 grit, or use a ceramic stones, lapping films or even a whetstone, I still would use the same stropping grits for any of these. If I’m seeking to strictly finish, or set, the sharpened edge I like to use the 4µ/2µ emulsion pair. It’s a good balance between sharp and polish. I like the feel of the emulsion compounds and the 4/2 is a good blend of coarseness and fineness. If I’m seeking a little more polished look, I’ll expand my strop progression and add the 1.0µ/0.5µ on the end. When I’m trying for a show-off polished shine, I would expand the stropping progression still further, starting more coarse than the 4µ and finishing finer then the 0.5µ. Stropping is the only technique that utilizes a lot of pressure. Due to the softness and the compressibilty of the stropping substrate, it’s important to find the stropping angle, and adjust to it, that fits your method and technique, to allow you to appreciate the enhancements that stropping brings without rounding off your sharpened edge. I’ve found decreasing my sharpening angle by 1-1/2 degrees works best for me, when using cow leather strops. Stiffer less compressing substrates require less of an angle decrease. This seems to be individualized and may take some trial and error to figure out what decrease works best for you. Stropping is always done in an edge trailing direction, to avoid cutting the strop. That is up and off or away from the knife edge. Thanks for all the thoughts guys. I’m going to mess around with it some on a few test knives I have. I just noticed that the Pro-Pack II transitions from the 1.4/0.6 ceramics to 1/0.5 micron pastes. From what I have heard, the emulsions are more effective than pastes of a given grit. I have actually thought of a powered systems (like a Tormek clone) for knives that need major reprofiling but my space is limited. Lenny, realize the Pro Pack II was introduced about 5 or 6 years ago, possible longer, with those includes grit mediums, in that combination and it has never been changed or updated, since. It was conceived as a sort of, “one size fits all” combination top-of-the-line sharpening set-up. It still works today, just as well as it did when introduced, so “if it ain’t broke” why fix it. If you look at the newest iteration, the Pro Pack 3, this now has no ceramics stones, includes diamond lapping films, and 4µ/2µ emulsion stropping compounds. This is an example of newer sharpening experience and ideology. Today, we have more products and more grit varieties available, to choose from. We’re also 5 or 6 years further along in Wicked Edge sharpening experiences with newer, more innovative and improved products, used by more Wicked Edge knife sharpeners who are sharing their experiences. Sure, but what I was getting at was that if 1/0.5 micron strops (with a less aggressive compound) wasn’t a good fit to follow the Micro Fine Ceramics because they are not aggressive enough, why wouldn’t have they opted for the 5/3.5 micron strops instead? Lenny, I sent you private messages. Click the blue circled number upper right on your browser screen. Yes, I know about lapping film and use them when I am going for a truly mirrored edge. I am not interested in achieving a perfectly mirrored edge in this instance for economies sake. My question was more in regards the experience users have with following the ceramics with 4/2 micron and 1/0.5 micron strops and if they were to use only one, which they would pick. I think I more or less agree with you there in that the 4/2 micron are a sensible choice. Edit: I only reply here to keep the conversation public in case someone else interested in this may find it later on. This reply was modified 2 months, 3 weeks ago by Lenny. airscapes: Running a buffing wheel on a drill press should be no problem, equipment-wise. Obviously, you’ll have to pay particular attention to knife position, in that it is an unorthodox approach. I have an old pair of rather heavy deerskin (maybe cowhide?) gloves I use when working at the polishing stand. With them, I don’t usually tape the edges when I’m just polishing the handles. I also have a couple of pairs of the cut-resistant gloves, but I don’t feel as confident with them in terms of grip. I run 10″ diameter buffing wheels on my 1750 RPM buffer, so I’m running about 4600 surface FPM. The mandrels are 5/8″ diameter. With a 1:1 pulley ratio on your drill press, you’d be at about 3700 surface feet per minute, so you’ve got the latitude to run at a faster ratio as well. With a horizontally oriented polishing wheel, you have the possibility of casting debris around a larger area than just a stripe up the wall behind the polishing stand. Find a large cardboard box and cut it to shroud the wheel area. This reply was modified 2 months, 3 weeks ago by tcmeyer. @tcmeyer Sent you a PM rather than hijack this thread farther.